Netanyahu and other Israeli politicians respond to car attack, praising IDF soldiers for shooting terrorist and calling for a crackdown. Several Israeli politicians praised the IDF for its handling of a car terror attack on Thursday, in which an Arab terrorist seriously wounded two Israelis and lightly wounded a third at Sinjil, near Shiloh, in Samaria. An IDF force near the scene of the attack responded quickly by shooting the driver, who was left wounded and trapped inside his vehicle. 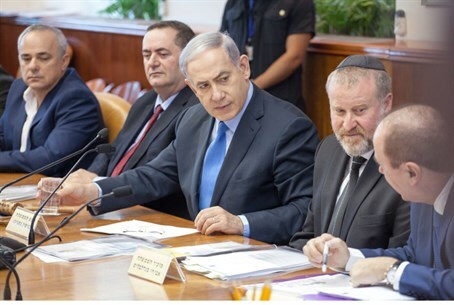 Prime Minister Binyamin Netanyahu said, "I wish to praise the actions of the IDF soldiers who responded quickly and neutralized the car attack terrorist, and to wish a full recovery to the wounded." Commenting on the rapid condemnation following last Friday's lethal arson attack in the Arab village of Duma in Samaria, he added, "it's curious to me that those who rushed to condemn (terror) against Palestinians, are silent when the terror is directed against Jews." President Reuven Rivlin said in response to the attack: "I am proud of our soldiers who responded immediately against the terrorist who carried out the horrific attack on Route 60. We do not and will never tolerate terrorism." "I express my support for the Prime Minister, and the heads of all the security services in their uncompromising struggle for our right to live and go about our daily lives in every part of the land of Israel. Together with all the people in Israel, my prayers and wishes are with the injured for their full and speedy recovery." "We must respond firmly against all those who harm citizens of Israel," said Science Minister Danny Danon (Likud). "Our enemies must know that an attack on our citizens will be answered with a strong hand. I congratulate the forces that were in the field for their quick response." Referencing the uproar about the Duma arson, Deputy Foreign Minister Tzipi Hotovely (Likud) said, "the shocking attack should remind anyone who forgot that the terror in Judea and Samaria on a near daily basis harms and threatens the Israeli residents of the area - and not the opposite way (i.e. not Arab residents - ed.)." "The time has come to step up a level in the war against the terror wave that is escalating at all times," warned Hotovely. Yisrael Beytenu chairperson MK Avigdor Liberman also responded to the attack on Facebook, saying, "I praise the IDF force that responded correctly and shot the car terrorist at Shiloh Junction." "The responsibility for this attack is also placed at the doorstep of the prime minister and the defense minister who aren't acting firmly against terror and aren't deterring it, but are rather doing the opposite," said Liberman. The leftist Zionist Union also responded to the attack, releasing a statement reading: "the prime minister must return the security to residents of Israel." "This is a serious incident of criminal terror. We praise the IDF soldiers who acted correctly and precisely, and stopped the terrorists from attacking more people, and we are convinced that the security forces will pursue those responsible for the attack until they catch them, so that every terrorist will know that the state of Israel doesn't let any terrorist escape its grasp." Agriculture Minister Uri Ariel said Thursday: “The residents of Judea and Samaria deal daily with abuse and terror attacks that are not reported in the press. This terror attack, like the ones that preceded it, is a direct product of the well oiled incitement system of the Palestinian Authority [PA]. Therefore, I do not expect them to denounce the act, the way we Jews know how to denounce our radical margins. I call upon the defense minister step up operations for providing security on the roads and junctions." Culture and Sports Minister Miri Regev said after receiving news of the attack: “It is time that [PA Chief] Abu Mazen [Mahmoud Abbas] cease his duplicity. I call on him to fight the incitement and the hatred that is rooted deep in the Palestinian Authority. It needs to be thoroughly uprooted. Thursday's attack caps off a wave of Arab terror attacks that began after Israeli politicians from all ends of the spectrum rushed to condemn last Friday's arson attack in Duma as "Jewish terror," after police estimated Jewish extremists may have been behind it based on the presence of Hebrew graffiti at the scene. The ensuing wave of terror has included attempts to burn down Joseph's Tomb, an apparent arson southeast of Jerusalem Sunday that released asbestos-laden ash on wide swathes of the city, a near-lethal firebomb attack in Jerusalem's Beit Hanina, and numerous other attacks of varying degrees. Despite the calls of "Jewish terror," police made a rare move on Tuesday in turning to the public for help in gathering clues, in an admission that the case is far from being closed. There are numerous question marks concerning the case, including reports of an 18-year feud between clans in the Arab village. The home that was attacked is located in the center of the village. According to Arab reports, the attackers first burned another home, purposely waited around to keep the parents from escaping, and later drew graffiti.